The First Global Forum on Youth Policies, hailed as ‘the most important youth forum of the decade,’ concluded with a commitment of all co-conveners to respect eight youth policy principles, discussed during the Forum, and to implement ten action points in the coming years. A month after the Forum ended, we are putting our own commitments to the community on the table. Click through for what we are planning to do in the next 3 years! Hailed as ‘the most important youth forum of the decade’ by Magdy Martínez-Solimán–currently UNDP’s Assistant Administrator and Director of the Bureau for Policy and Programme, formerly the Spanish State Secretary for Youth–the First Global Forum on Youth Policies brought together over 700 experts from governmental and non-governmental contexts: from ministries and agencies to universities, institutes, organisations, movements and networks. 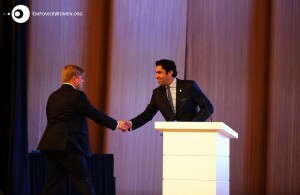 In terms of governmental participation — both attending ministers and delegations — it was the largest UN hosted youth-focused event since the World Conference of Ministers Responsible for Youth in Lisbon in 1998: 115 governments, including over 70 Ministers or Deputy Ministers, joined delegates from 165 countries for the biggest conference exclusively on youth policies ever held. 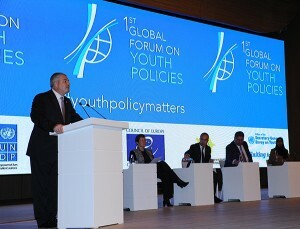 Working alongside the co-conveners, the UN Secretary General’s Envoy on Youth, UNDP, UNESCO and the Council of Europe, we — the team of youthpolicy.org — supported the Global Forum as a technical partner. Our responsibilities included handling the application process; building the Forum’s digital footprint and managing all social media accounts; assisting in the programme development and delivery; and co-facilitating the Global Forum. We also ran around the Heydar Aliyev Centre. A lot. Our film crew, the team of the splendid Agentur Gretchen, also worked day and night to produce three summary films: Day 1; Day 2; Day 3. Take a look! Cristina from our team, second from left, while facilitating a thematic session on legal frameworks. Photo by Emad Karim. During one of the night shifts, while reviewing the third video, we were all wondering aloud whether people really laughed, smiled, chatted and talked as much as it seemed from the footage. There were, of course, many moments of sincerity and reflection about–and even anger and frustration with–the situation of youth policy and young people around the world, but we feel that the emerging community of youth policy professionals really did enjoy its first gathering enormously, and much like everyone else, we left Baku on a high note. Now, with a month of distance, we want to share some of our thinking about the Forum with the community, and hope that you will add your thoughts and voices, by commenting on this article, submitting a guest post for us to publish (email us at team@youthpolicy.org), or link to your published reflections (as some of you have done already: here, here and here). The Baku Commitment (pdf) is an expression of values and intent by the co-convening organisations: Envoy on Youth, UNDP, UNESCO and the Council of Europe. 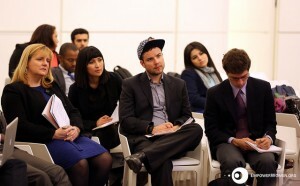 It seeks to describe how the co-conveners intend to carry the momentum of the Global Forum forward. Rather than giving recommendations to others, it’s a document that simply states the pledges of those who convened the Global Forum. The Commitment details eight guiding principles of youth policy development (rights based, inclusive, participatory, gender-responsive, comprehensive, knowledge-based and evidence-informed, fully resourced, accountable), which were extracted from the discussions at the Global Forum that were skillfully captured by a team of rapporteurs led by Jonathan Bowyer, and ten action points the co-conveners will implement, which were drafted by the co-conveners beforehand and then finalised on site, again taking the Forum’s discussions into account. 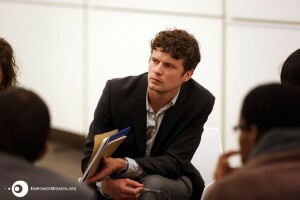 John from our team, while facilitating a thematic session on legal frameworks. Photo by Emad Karim. There are a good number of conferences and structures that negotiate outcome documents, the 2014 World Conference on Youth being one of the most recent, and while there is a space for such negotiations, we did not want to add the Global Forum to the mix of negotiation events. We were hoping that the co-conveners’ commitment to meaningful follow-up action would inspire similar pledges and actions from within the community, and we were very happy to see that expectation widely exceeded by the commitments made by the community during and after the Forum, such as the creation of the African Network of Youth Policy Experts and the Caribbean Youth Policy Institute. The launch of the Global Initiative on Youth Policies has us pretty excited: it not only seeks to support the development and implementation of national youth policies, but has more widely the enormous potential to strengthen the architecture of the global youth sector. As outlined during the launch of the Global Initiative—as one of the commitments of the co-conveners—in the closing plenary, the initiative will focus on three areas: technical assistance and capacity development; strengthening knowledge and evidence base; and global advocacy and awareness raising. 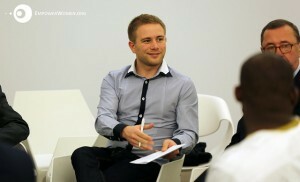 Alex from our team, while facilitating a thematic session on legal frameworks. Photo by Emad Karim. We see a clear need for these, and have high expectations for their realisation. We are excited about what the Global Initiative can potentially achieve, from building resilient youth policies to elevating the status of youth issues, and look forward to working with the co-conveners and the community to take its vision and ambition and translate them into practice as best as we can. The initial questions—who will coordinate the Initiative, where it will be based, how it will work, how it will be financed, how long it will take to set-up and how wide-ranging and inclusive its remit will be—are all being worked on already, and we expect that January 2015 will see the release of a more substantiated framework for the Global Initiative. We have to admit: when we started discussing what eventually became the First Global Forum on Youth Policies with 700 people attending, we were thinking about a smaller event. A much smaller event. We were confident that we could bring 300, maybe 350, people together easily, and our thinking stuck with that number for quite some time. We were, however, blown away by the overwhelming response, as all co-conveners were: close to 5000 activists, experts, practitioners responding to our open call, more than a hundred governments wishing to attend, more than fifty researchers willing to contribute voluntarily, and the amazement went on and on. This is by far the biggest, and most important, achievement for us: We were inspired by the size, diversity and dedication of the community of practitioners that are championing, promoting and contributing to national and regional youth policies across the world. We hoped that individual and organisational networks were ready to be formed, but the strong sense of belonging, shared identity and common values and beliefs that we saw emerging at the Global Forum have been an absolute pleasure to foster and to enjoy. While we will support the implementation of the Baku Commitment on Youth Policies and the Global Initiative as best as we can, we also want to make our own commitments to you. We, as a community, and we, as a team, have collectively spent too much time and energy to let the opportunity slip by and continue as before. Andreas from our team walking on stage to take over the lead facilitation. Photo by Emad Karim. Contribute to the next Global Forum on Youth Policies, seeking to create more, and more diverse, spaces for exchange and engagement during and next to the event. Unless there is something else you want us to do in addition? Andreas, Alex, Bowe, Bronwen, Cristina, Ellie, Ellen, Emilia, Jacob, John, Lisa, Paul. The core team of Youth Policy Labs – the think-tank behind youthpolicy.org.